If a picture is worth a thousand words, a lot of photographers aren’t getting paid enough. When a writer actually manages to build a business for themselves…well let’s just say we do okay. Most of us don’t get rich, but we do okay. WDD and others are good to me. I’ve been lucky enough that I’ve been able to sell my words online, and make a living from it. 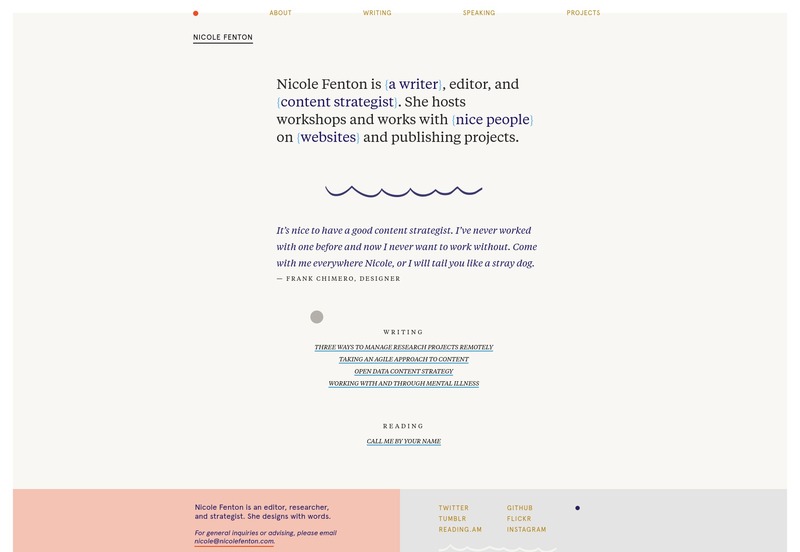 I recently re-designed my online writer’s portfolio (well, I’m still iterating), and it’s gotten me to think real hard about that: selling words online. Almost any other product can be sold with imagery, and some of them pretty much couldn’t be sold without some photos in the equation. But words? Words can be sold with just words; though images are often included. I thought it could be useful to other designers and writers out there to see how some of the successful writers do it, so I went looking for examples. Here they are. Note: I’m more interested in their strategy than I am in the originality or technical side of their site design, so this isn’t much of a web design showcase. You will see more than a few themes in here. Nicole Fenton seems to believe as much as I do that, ideally, words should sell themselves. Typography is the clear focus of the layout, with only a couple of light stylistic flourishes by way of distraction. The sales strategy follows the design: less is more. There are perhaps four whole paragraphs on the entire site that you could classify as “sales copy”, and the rest just shows off her work. 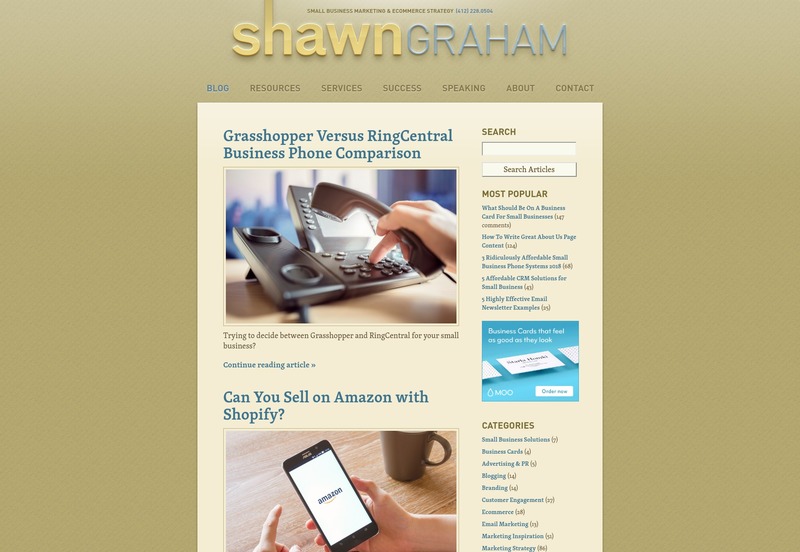 Shawn Graham’s site, on the other hand, will remind you of every marketer who ever annoyed you, and it probably works for him. The design looks like a WordPress theme, with a logo ripped straight from Web 2.0 (the design style, not the social networking). The strategy is a classic: the blog. It’s filled with helpful advice about a variety of marketing-related topics, and strives to educate its users while showing off Shawn’s expertise. 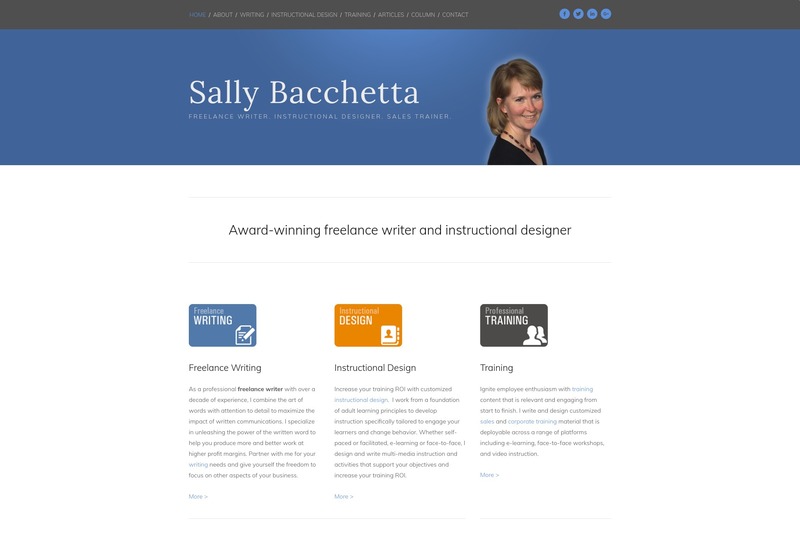 Sally Bacchetta’s site looks as corporate as they come, right down to the cut-out picture of her with the faint white glow around the edges. It could not possibly look any more plain and businesslike. This actually is the idea, here. She writes and designs instructional and training materials for corporate clients, and so both the site’s design and her copy reflect this unerringly. It might look dull to some, but it will look comfortable and familiar to her ideal clients. Michael Petrov’s site is quite minimalist, but makes use of heavy, and almost heavy-handed animation. At this point, though, that’s par for the course with portfolio-style sites, and we’ll see that style leak from the web design industry to every other industry where making an online portfolio might be appropriate. Now I can’t read French, but imagery is clearly a part of the sales process, here. It’s all custom illustration with light animation, so it’s designed to fit the theme of the author’s work, and many of the illustrations seem to be paired with a quote. 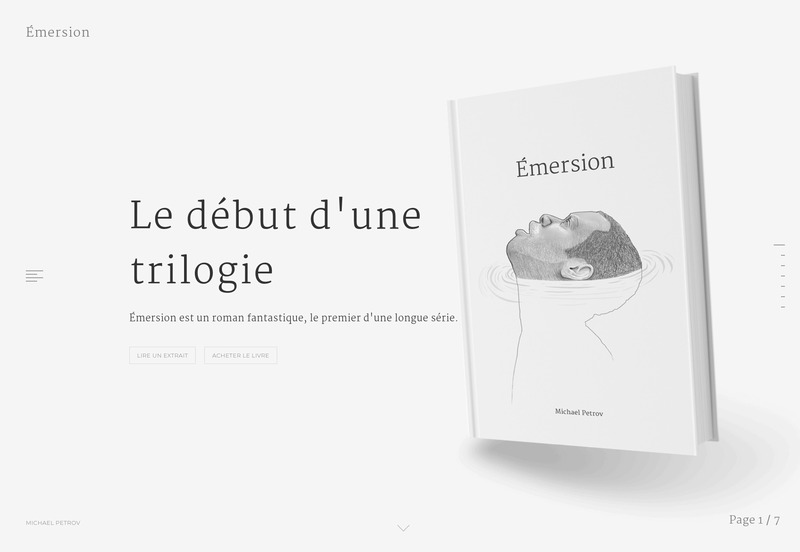 It seems the book being promoted is itself a fusion of both literary and visual art, so the site follows its lead. 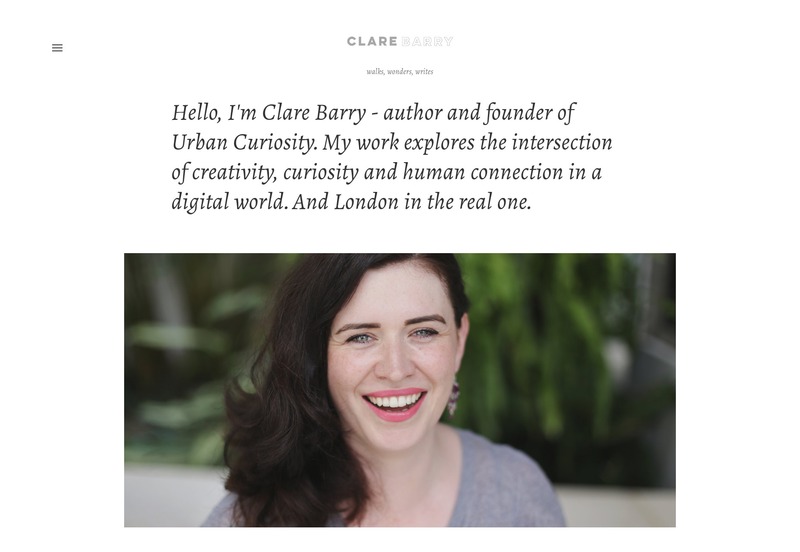 Clare Barry’s site is built with Squarespace, so it looks predictably modern, clean, and generally pleasing to the eye. There’s decent typography, a solid grid-based layout, everything you’d expect. Clare Barry, it seems, has opted for a fairly classic approach: sell via personality. Where many sites on this list have a picture of the author somewhere, this one puts her front and center, smiling for the world to see. Much of her work seems to stem from her own experience, and deals with personal issues like work/life balance, burnout, and wellbeing. Personal subject matter means you have to put some effort into selling the person, so it makes sense, and she hired a good photographer. 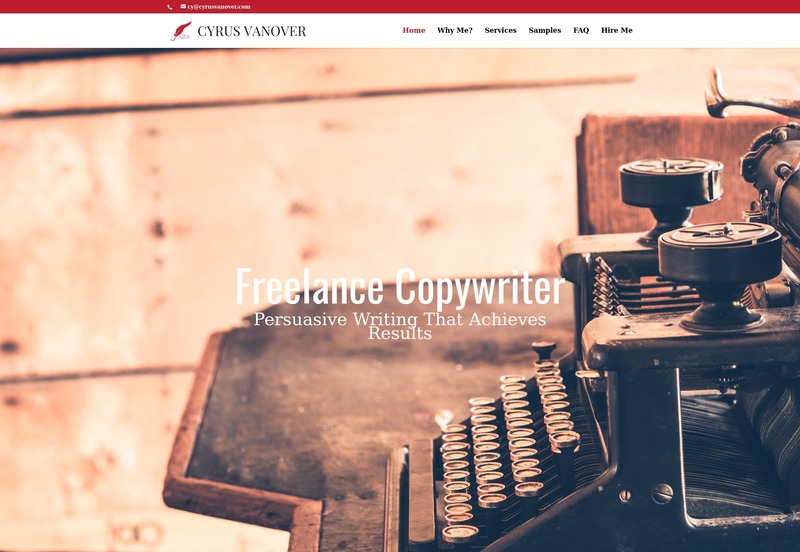 Cyrus Vanover’s site is built with Divi, and is very clearly targeted at fairly traditional clients. The design itself isn’t going to blow any minds, but it’s clearly designed to make you start reading, already. You see, the idea here is to show you how persuasive the author’s writing is by exposing you to that persuasiveness first hand. I wouldn’t call it a hard sell so much as simply putting the proof out where you can see it. The writing samples are almost incidental: the portfolio site is the portfolio piece. 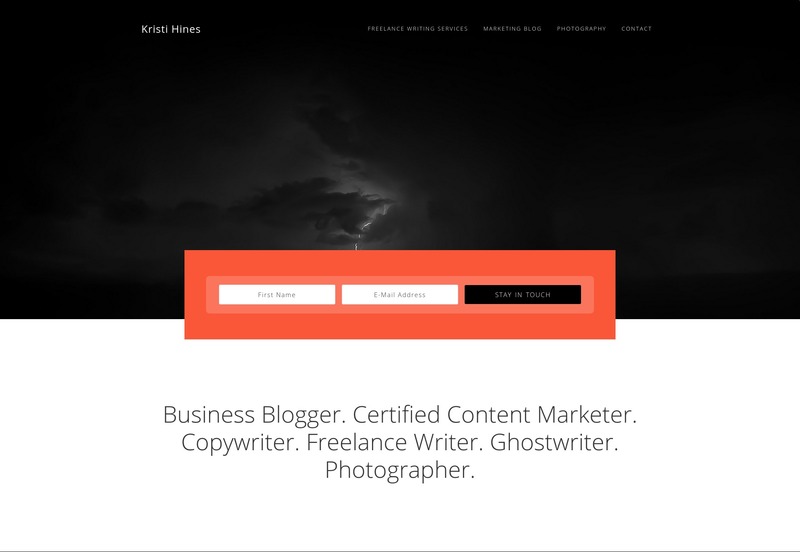 Kristi Hines’ writing portfolio uses a pre-made WordPress theme that has a flair for the dramatic. There’s the color palette that makes full use of almost-harsh contrast, combined with a clean and modern style. Even so, it’s nice and readable. The sales tactics used are actually a bit of a hybrid system. There’s the blog, the “what-I-do” copy, and so on. But the home page really doubles down on the social proof. There are prominently featured testimonials, a huge collection of famous brands she’s worked for, the works. She’s not just a writer, she’s a social marketer, and she can prove it. She’s also a photographer, and she includes her photos on her site, though I don’t think that’s a part of the service. Just an interesting tidbit.